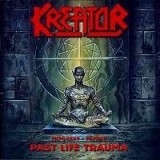 KREATOR - 1985-1992 PAST LIFE TRAUMA (CD) | Online Shop | Wizard LTD. Album: "1985-1992 PAST LIFE TRAUMA (CD)"
Past Life Trauma (1985-1992) is a compilation album by German thrash metal band Kreator, compiled by lead singer/guitarist Mille Petrozza. It was released in 2000 by Noise Records. Tracks are taken from the albums recorded between 1985 (Endless Pain) and 1992 (Renewal). Track 5, 8, 9 and 15 are rare tracks.